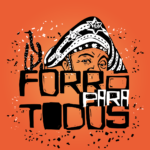 Since 2013 we are bringing Information about Forró to a German/English speaking community though Radio / Podcast. Four Forrózeiros from Freiburg founded the Project in 2014 but little by little the participants moved away and got involved in other projects. Since 2017 Vadinho relaunched the podcast and maintains the project. Our Podcast Forrozin no ar airs monthly on the free radio station Radio Dreyeckland for 120 minutes. On the 1st Sunday each month you can listen to the program from 10 pm around Freiburg at 102,3 Mhz or worldwide on the Live-Stream. Since this is a Podcast (Wikipedia) you can subscribe to our programs by inserting one of the following links in a Podcatcher.